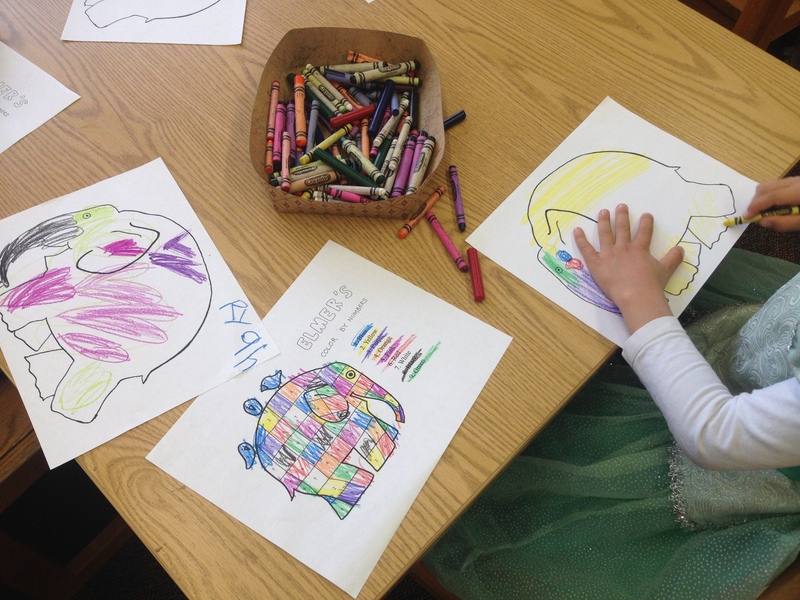 After learning that many elementary students had their own Instagram account (yes, I know the minimum age is 13), I made a school library account, and I have a small following of students and parents. I post one or two pictures a week at most, I don’t post students’ faces, I don’t follow any students or parents back, and it takes almost no time at all. 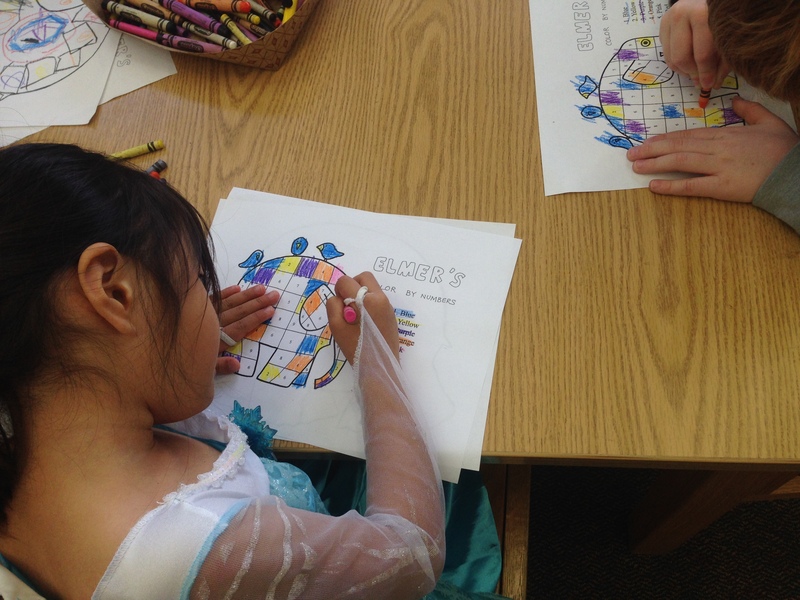 Pictures of new books, book displays, author visits, and activities in the school library. 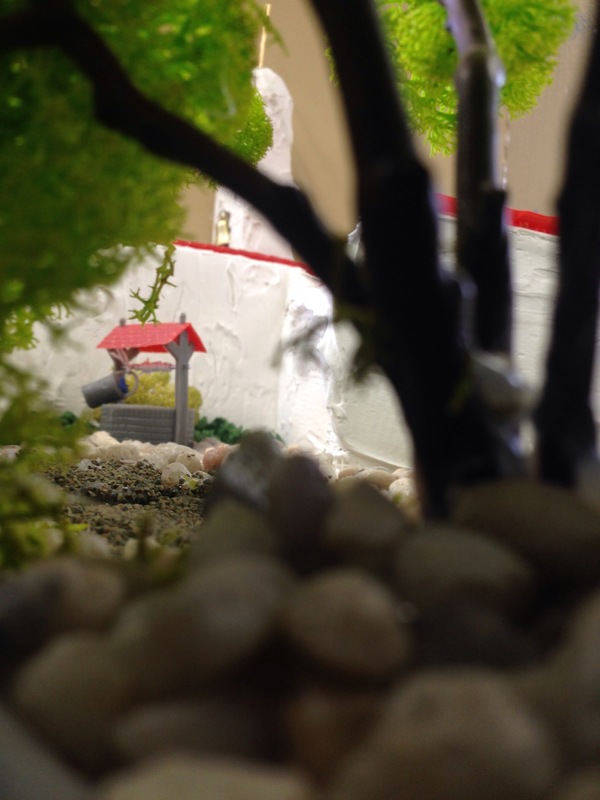 Students used my phone to take some striking close-up photos of the California Mission projects that were on display. I posted a time-lapse video of how to cover a paperback. 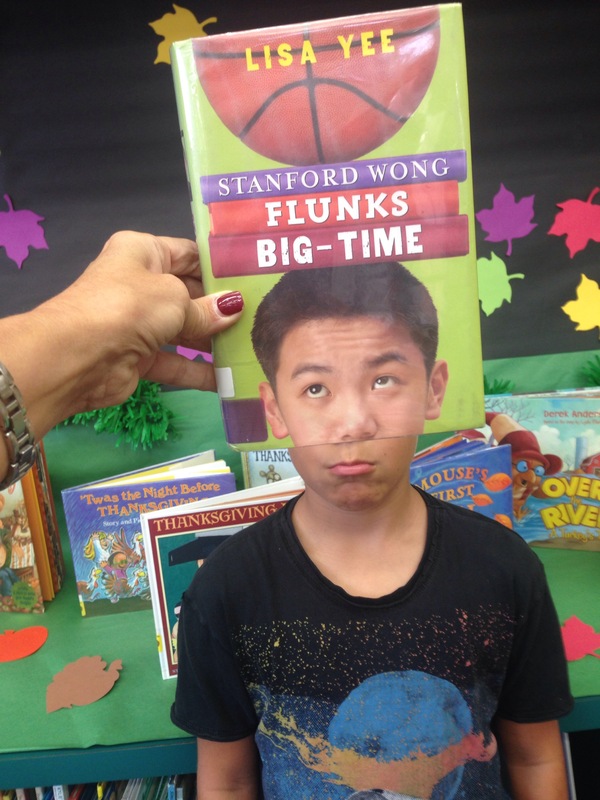 Hands down, the most fun posts are the #BookFaceFriday pictures. 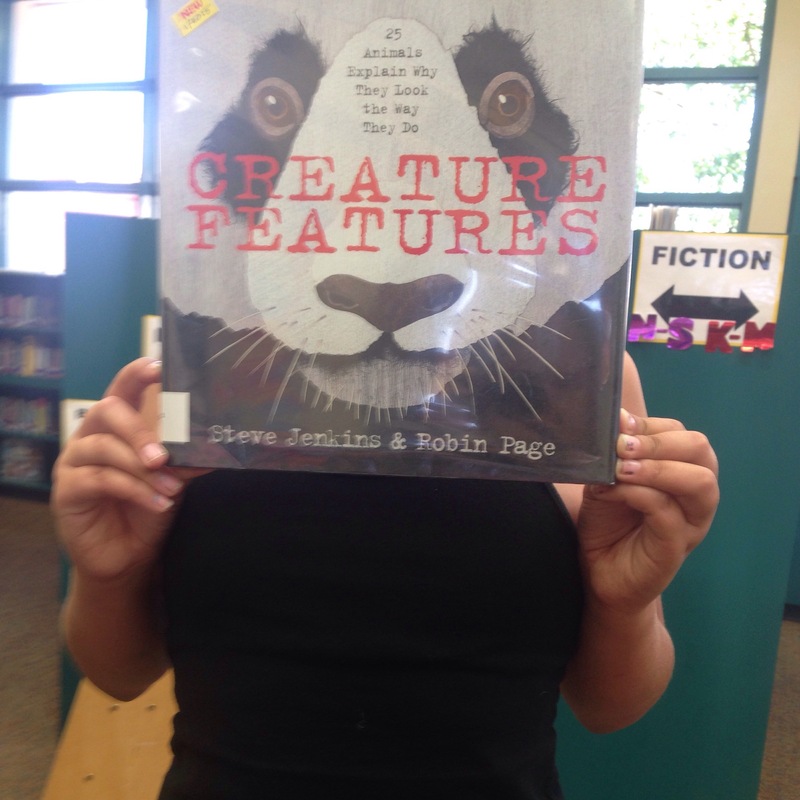 Google the term and you’ll be entertained by the librarian phenomenon of posing with a book cover and matching face or body parts to the cover. 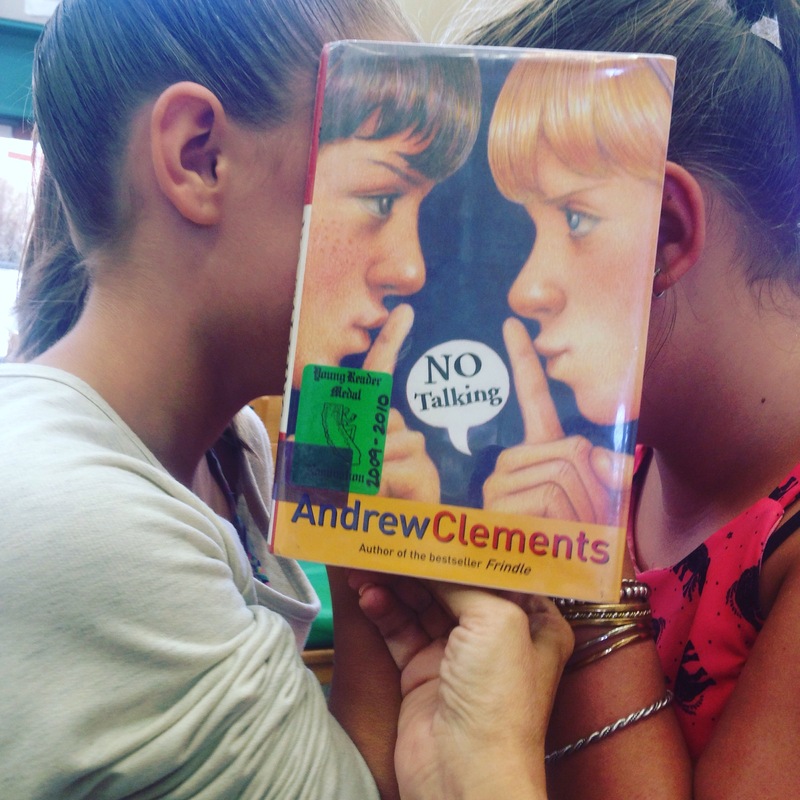 Students love to scout the library for photo possibilities. If you are new to Instragram, and don’t know how to use hashtags, take a look at the 5MinLibrarian’s 31 Days of Instagram Challenge for easy ideas and inspiration. You’re all invited to follow me on Instagram @opelibrary. I don’t follow individuals back, but I follow various library accounts. New school clothes aren’t just for kids. 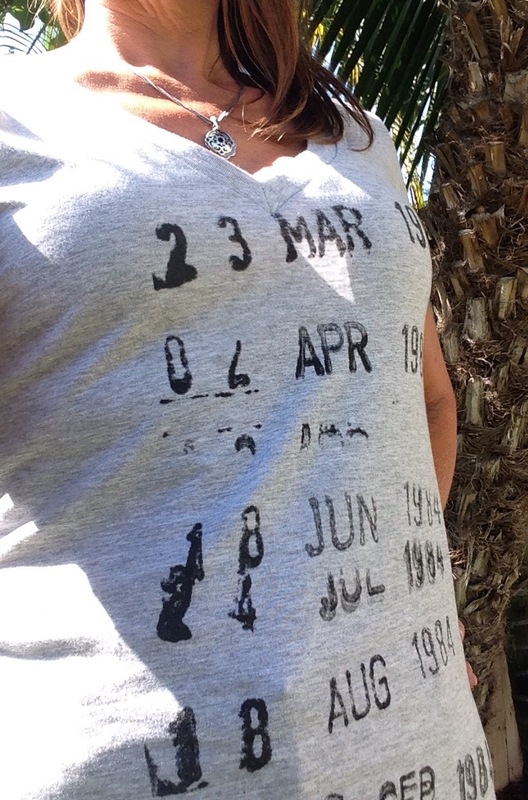 Loving my new shirt from Book Riot. Check me out! I’m having so much fun with this library parody of the Frozen song, Let it Go. I’ve been playing it at the beginning of every class visit on the big screen, using an iPad and Apple TV. 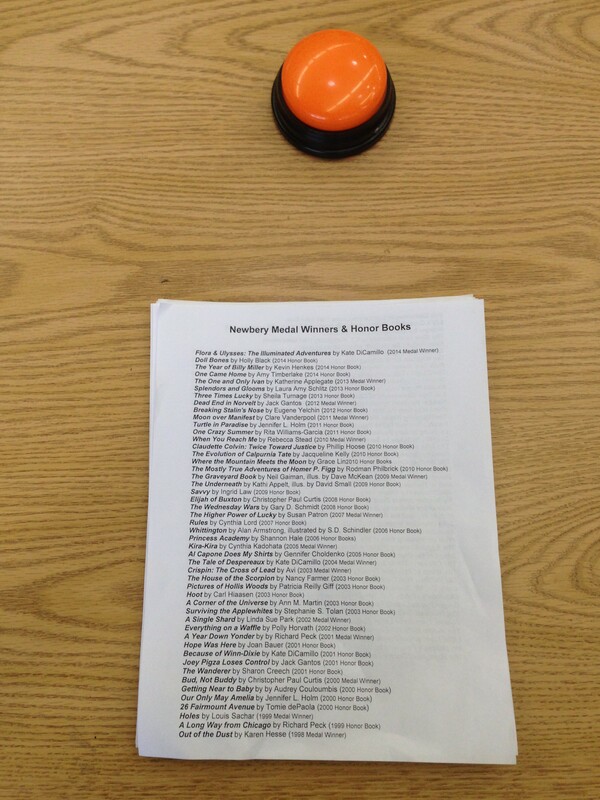 We listen to it once, and then I play it again and use cue cards, so students can sing along. 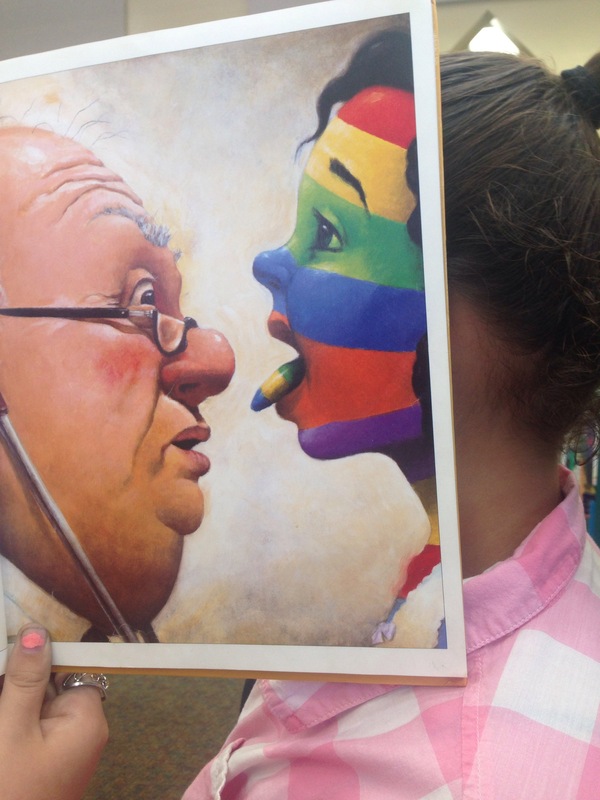 (It never hurts to mention how well another class performed it, to promote a little informal, friendly competition.) If you don’t have a big screen in your library, you could email the link to teachers to play in the classroom. I’m sharing the cue cards below, in case you want to use them. I changed the line, “Just pay a fee,” to “There is no fee,” because I don’t charge late fees. I transcribed the lyrics from listening to it over and over, so they are as close as I could decipher them. I hope this song gets stuck in their heads, like it is in mine. Leave me a comment, and let me know if you try it. I added some googly eyes to my scanner today (with removable blue painters tape), just for smiles at checkout time. 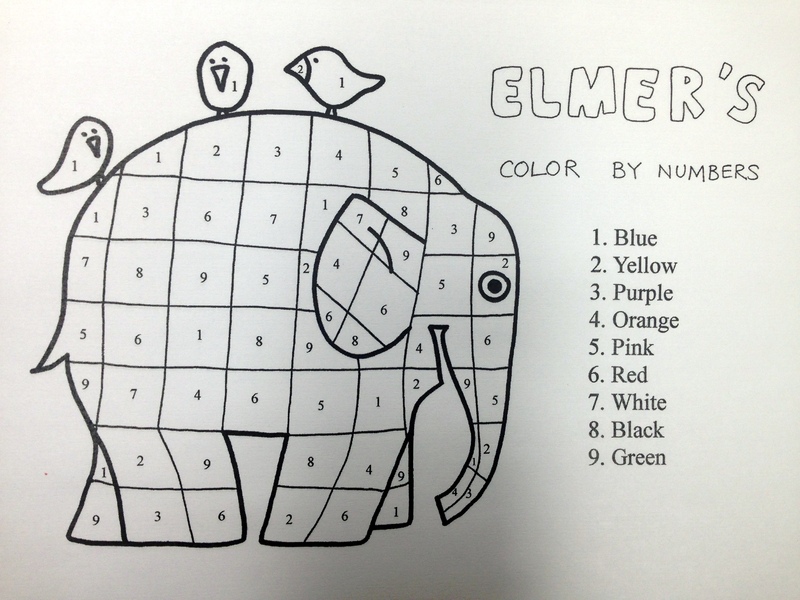 Transitional kindergarteners enjoyed hearing the story of Elmer, the colorful, patchwork elephant, and coloring the squares by numbers. I also gave them a blank elephant to decorate however they wished. 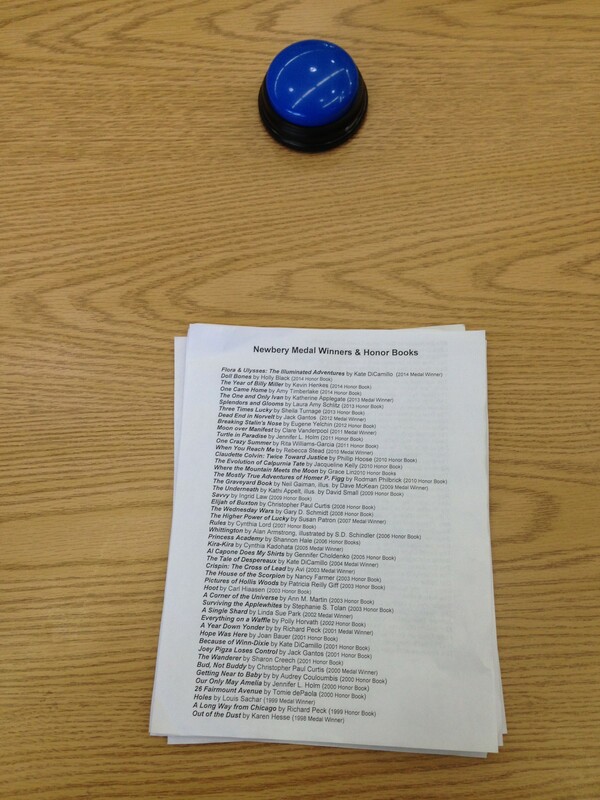 I chose authors that I have multiple books by (Brett, Carle, Numeroff, O’Connor, Shannon, Willems, etc. 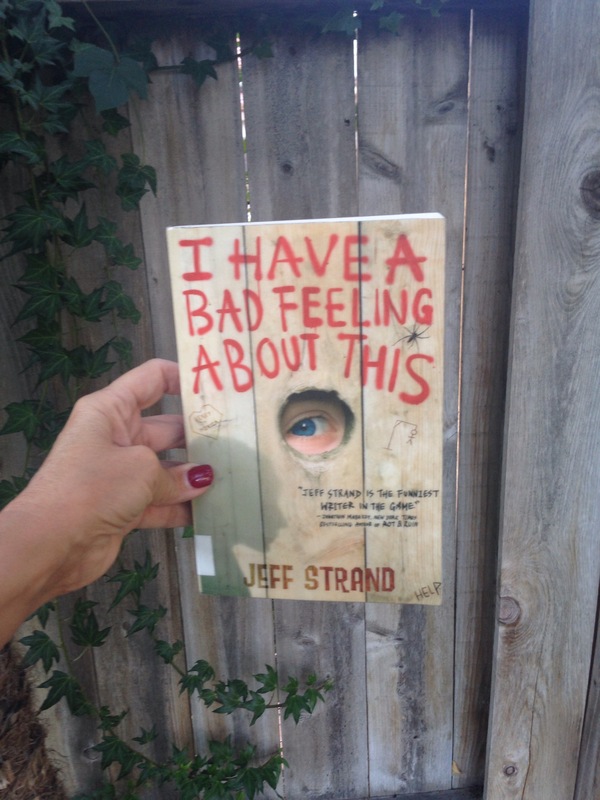 ), to minimize the likelihood that all the books by that author would be checked out. Just in case, I printed some blank spine labels also, for me to write on at the last minute. 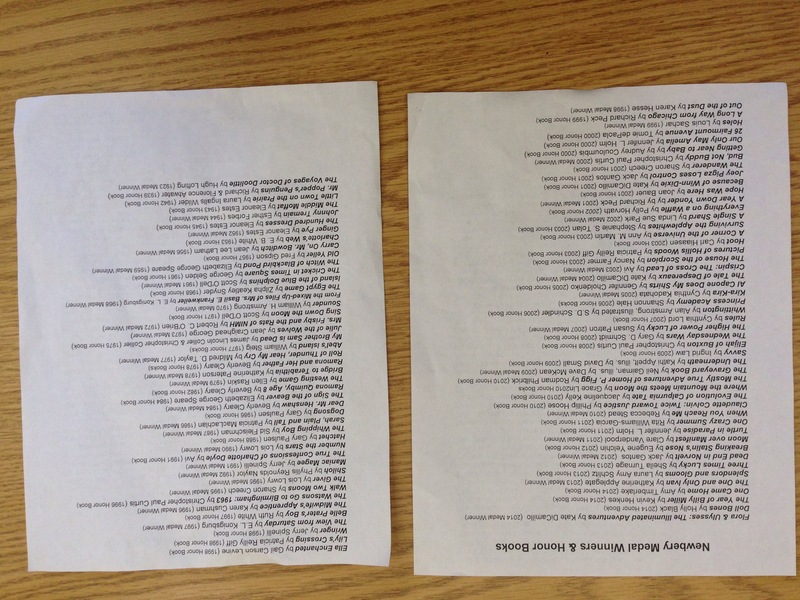 I folded the strips, and put them in a bowl for students to pick from. I thought making it feel like a secret drawing might add some suspense/interest. I set out pencils, and invited 1st and 2nd graders to “earn” a bookmark by locating a picture book with a matching spine label, writing down the title, and bringing it to me when they check out their books. Most students wrote a book title down, as instructed, but quite a few BROUGHT me the actual book–which I did not want to happen because I didn’t want to make more shelving work. Oh, well. 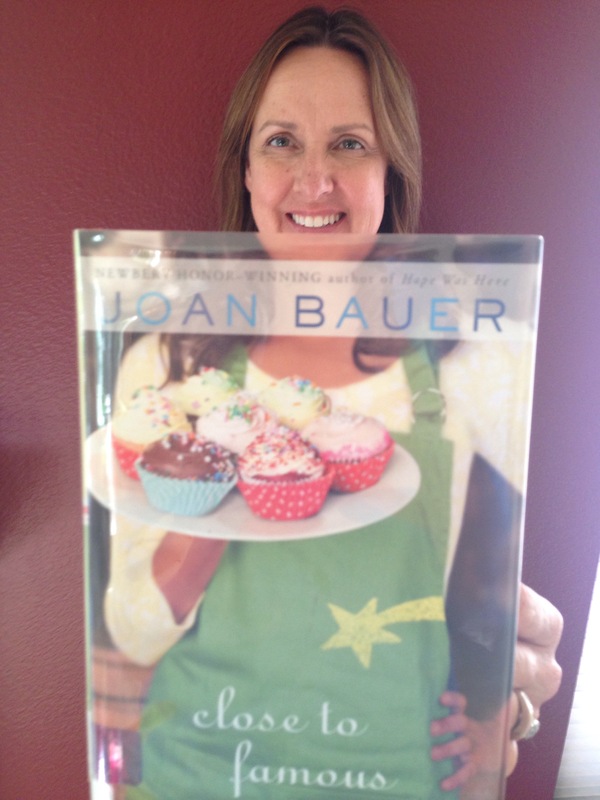 We are making progress toward having empowered book searchers! If you are a fan of Jan Brett’s many beautifully illustrated books, you could spend hours on her website, www.janbrett.com, looking at all the resources she has provided to accompany her books. 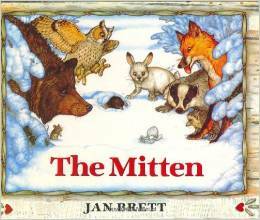 The Mitten, Jan Brett’s charming adaptation of a Ukranian folktale, is about a boy who loses one of the white mittens his grandmother knit for him, despite her prior admonition that white mittens are easy to lose in the snow. Forest animals crawl inside, one by one, until the bear sneezes them all out, and the mitten goes flying through the air, to be found by the boy just in time to show his grandmother that he can be trusted not to lose them. They are both left wondering why one mitten is so much larger than the other, and only the amused readers and the forest animals know the answer to that question. This captivating story provides the perfect opportunity to encourage re-telling a story with paper props to help with recall. You can find all the animals and mittens to print at Jan Brett’s website here. I printed the front and back of the mittens onto construction paper from her website (not pictured), pre-stapled the front and back together, and let students cut around the edge of the mitten. 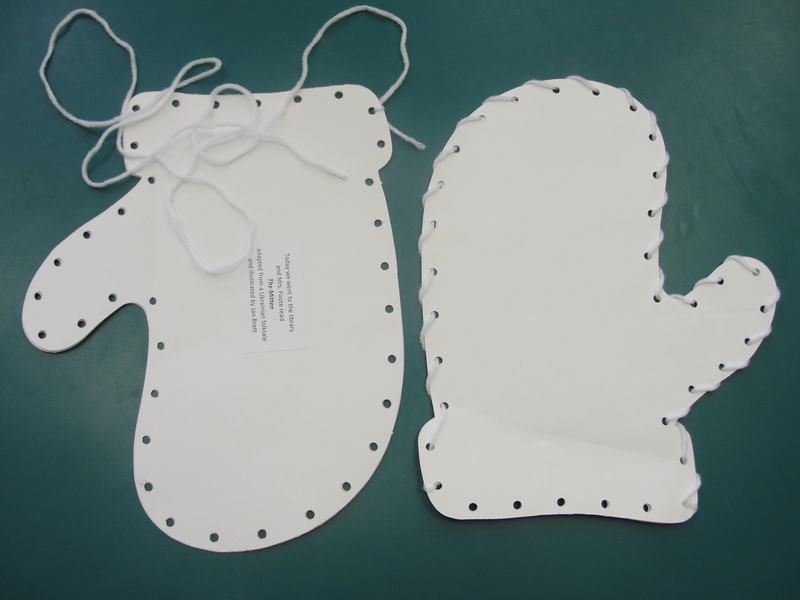 Since it’s pre-stapled, it’s great for those new to cutting, since exact accuracy doesn’t affect the desired outcome, which is to be able to put the animals inside the mitten. 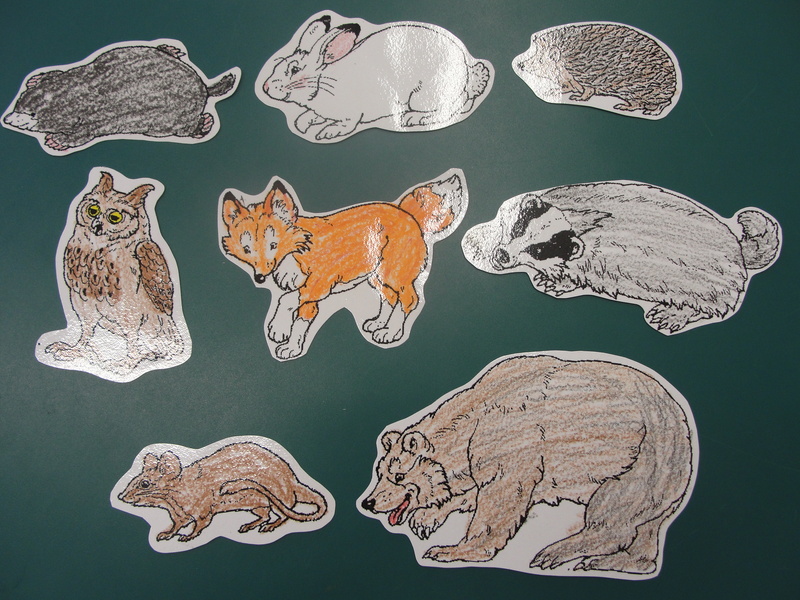 Animals can be colored, or not, and students can use them to re-tell the story to family and friends later. We practiced together once, and they were so proud that they could recall the order all eight of the animals crawled into the mitten. These die cut mittens (pictured below) are good for practicing fine motor skills, but if you don’t have the die cut, and still want to do it, you could cut the mittens out of construction paper or card stock, and use a hole punch around the edges. Wrap a small piece of tape around one end of the yarn, to provide a firm tip for easier lacing. Some of the 5-year olds whip-stitched (shown below), some laced up and down, and some did a combination of both. And of course, some went randomly back and forth from right side to left side, and needed lots of extra guidance to stay along the edges. All the more reason to practice lacing! Wrap red paper around the circulation desk. Set out markers, tape and paper hearts. 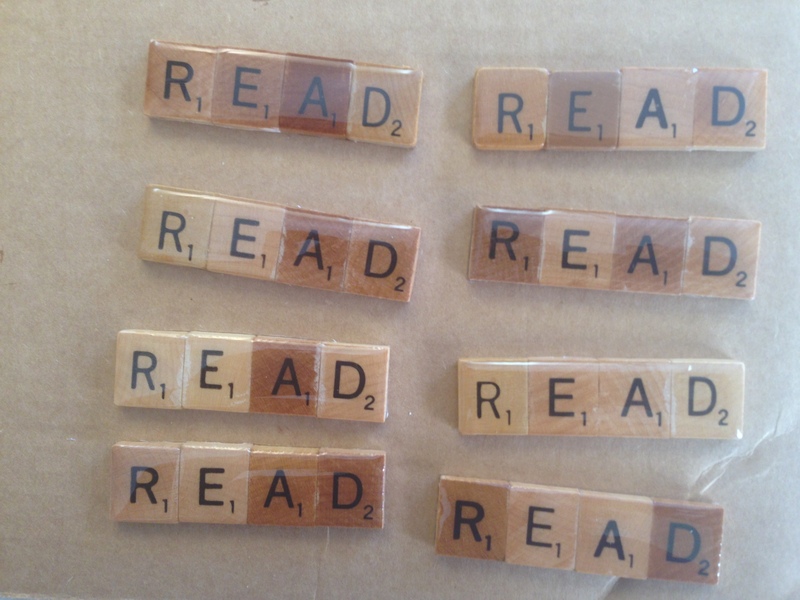 Ask students if they’d like to write the title of any book they’ve ever loved–from Hop on Pop to Eragon and everywhere in between–and tape it to the desk. Listen to all the conversations it generates. 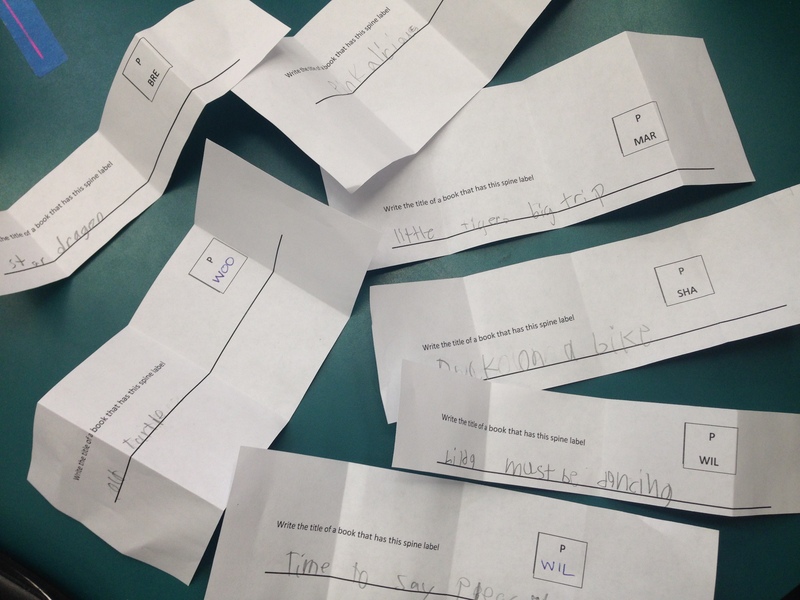 These are a few of the answers the 4th-6th graders excitedly called out when we played a Newbery Award game in the library this week. 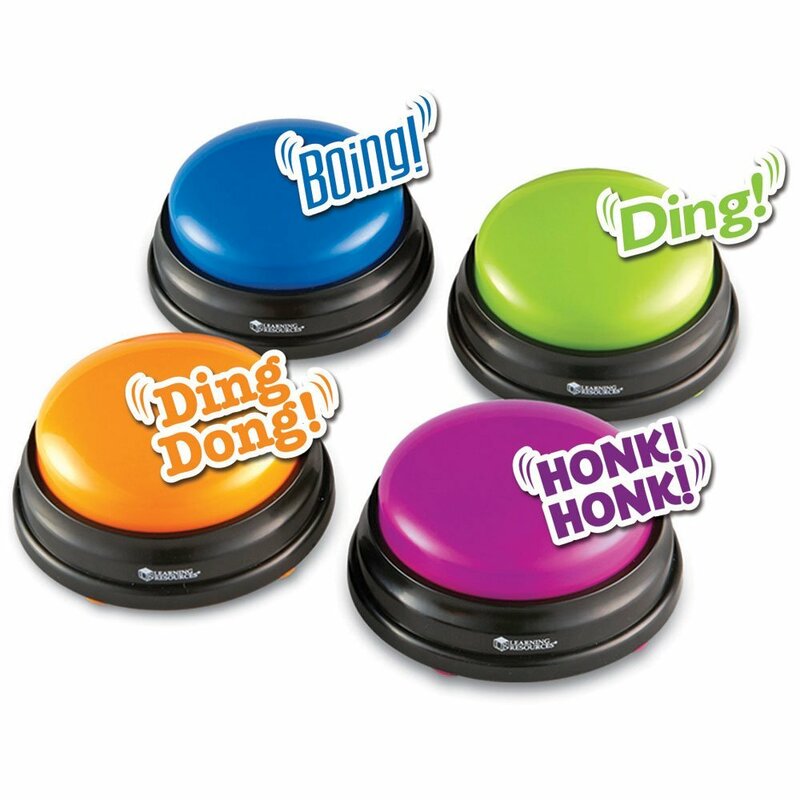 I’ll tell you the secret to making answering book title questions so much fun: It was these answer buzzers that each make a different loud, funny sound. Go to Amazon and order them by Learning Resources. You can do it right now. I’ll wait here. 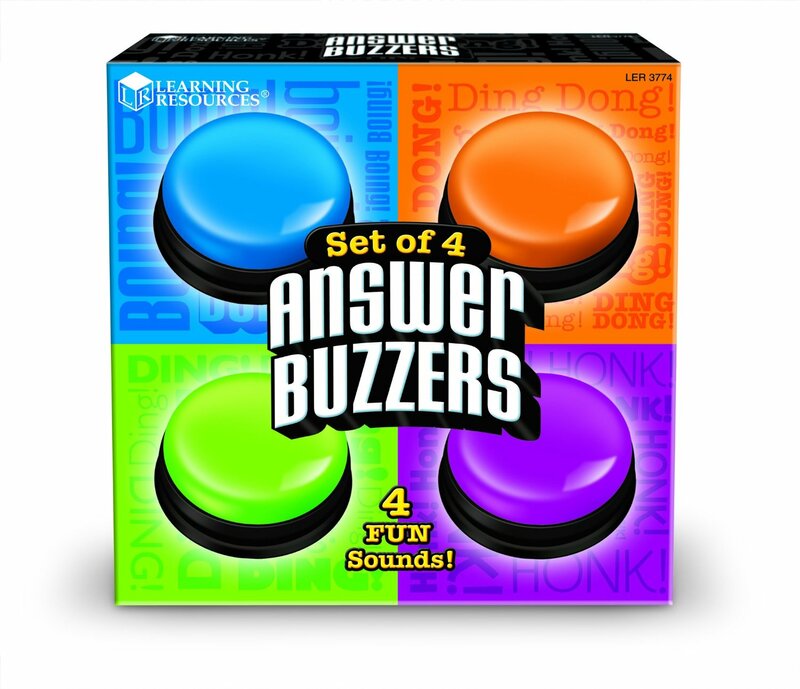 A fun-loving colleague from a nearby school district elementary library loaned me these answer buzzers, and gave me the inspiration for creating this game. It cannot be overstated how much fun it is to answer a question when one gets to hit one of these buttons first. In fact, I would go so far as to say that these should be used in court when questioning defendants on the stand. They are just that compelling. BOING! I confess, I did it. HONK HONK! Yes, I stole those items. DING DONG! I had accomplices, and I’ll name names. DING! I’ll tell you everything, as long as I get to keep hitting these answer buttons! I displayed Newbery Award and Honor books on a large table, and gave a short talk about the Newbery Medal. “Who knows what these gold and silver round stickers mean?” I shared some of the eligibility criteria, like the book must have been published in the United States in the preceding year, the author must also be a citizen of or reside in the United States, the book can be fiction, non-fiction, or poetry, and that children up through age 14 are the intended potential audience. I also shared some of the history; it is named for John Newbery, and the first award was given in 1922. 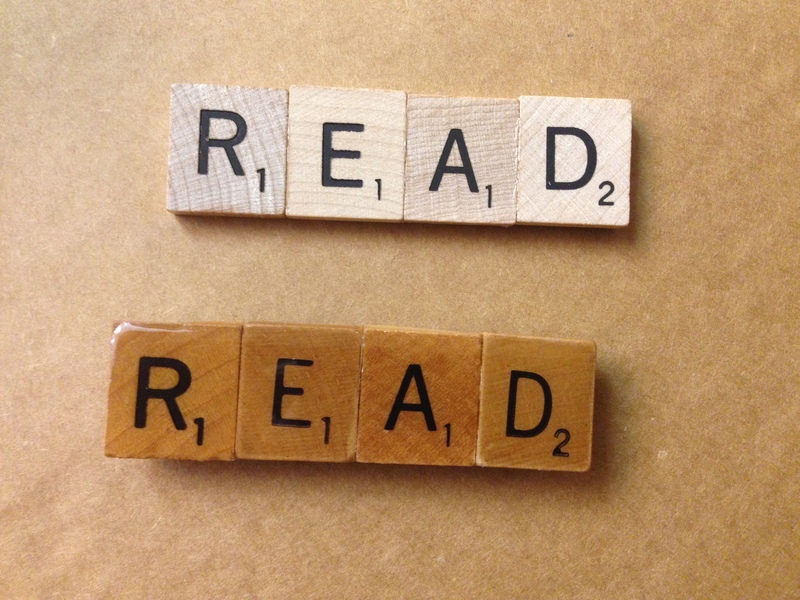 Information can be found right here on the Association for Library Service to Children website. Students eagerly raised their hands to tell me which books on the table they had read and loved. 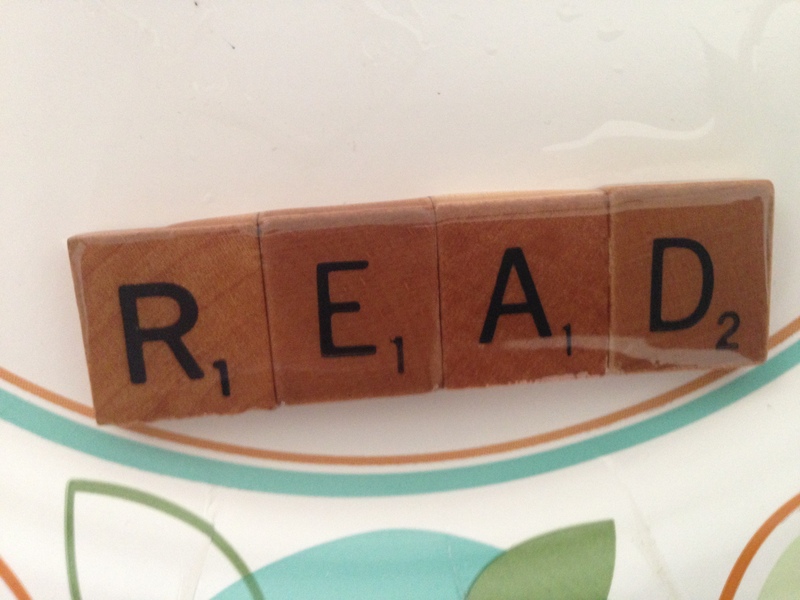 I believe the best advertising for books is from peers, and this was even better than I could have hoped for. 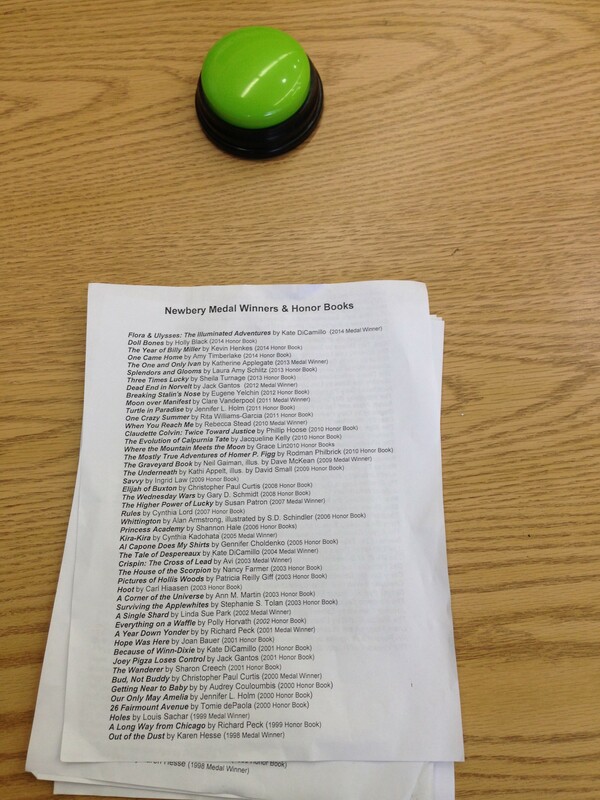 I made a two-page list of selected winners and honor books that best suited my needs for the game, that are in the school library collection, and made enough 2-sided copies for every student. 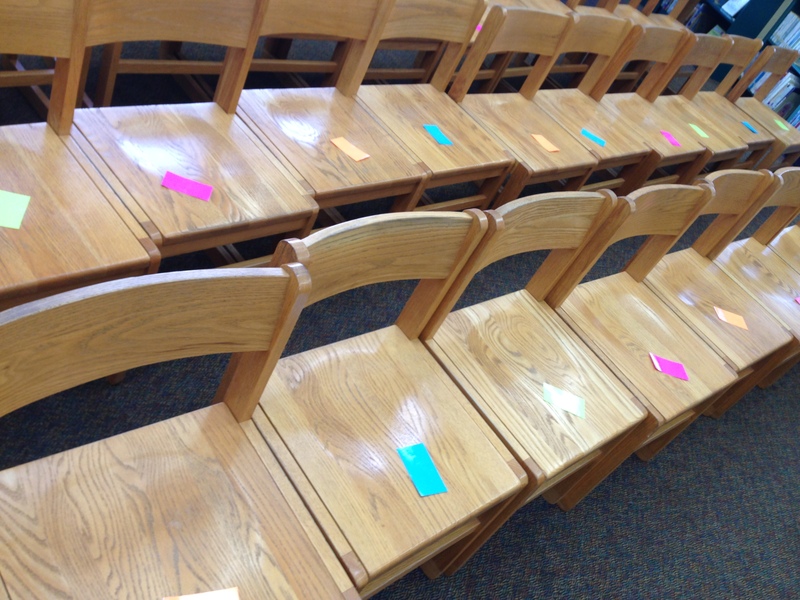 To make 4 teams quickly, I randomly set laminated, color-coded cards that matched the buzzers on all the chairs before the classes came in and sat down, to designated what team they were on. I learned from a teacher that if you say, “You have 30 seconds to get to your team table,” they get there MUCH faster. 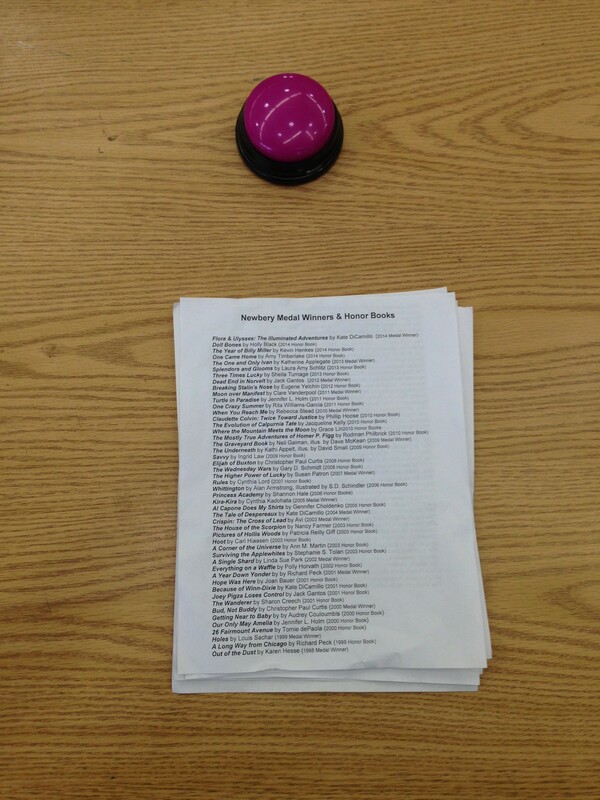 I read out clues, and teams searched the lists for books that met the description, and rushed to hit the buzzer first, and called out their answers. Below are some of the clues I came up with, but there are so many other possibilities. The last class of the day went MUCH smoother than the first, and I fine-tuned the process as the day progressed. One lesson I learned: We kept score for some classes, but not for others. Funny thing, it didn’t really matter. 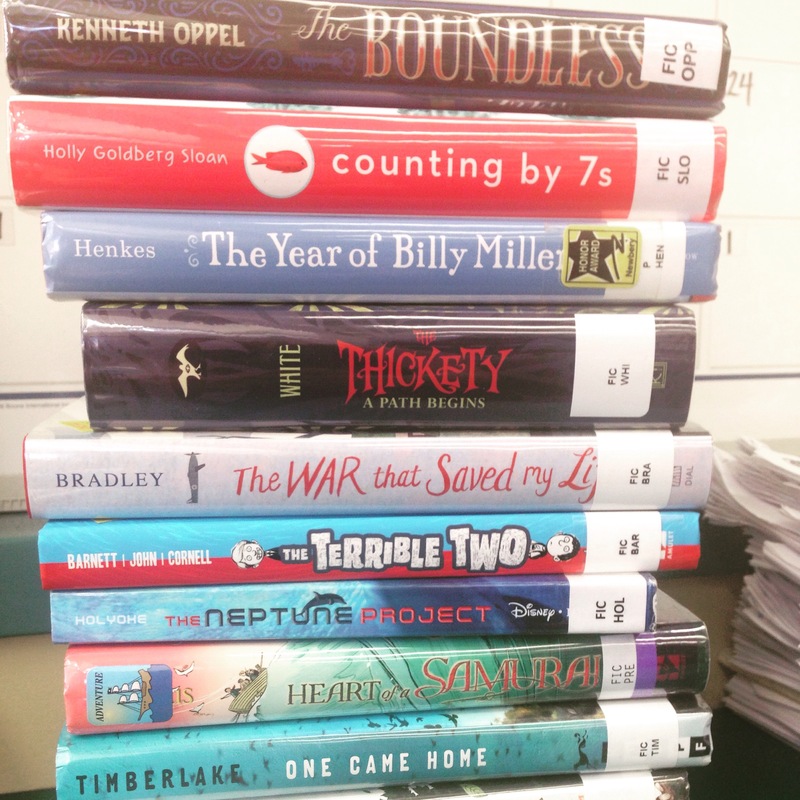 Kids loved playing whether they were earning points or not, and I just kept replenishing the books on the Newbery Award table as they were checked out. Several students stopped by after school to ask if we could do more games like that, and even brainstormed ideas on what the games could be. (“How about a Wheel of Fortune Game? 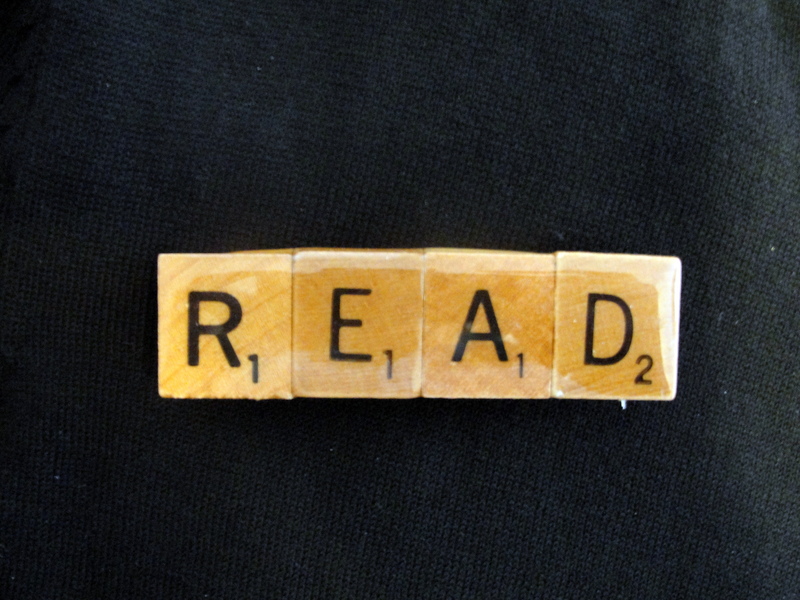 You could make a big wheel and send us off searching for books…”) You can’t buy that kind of excitement. Oh my goodness, I just checked: Amazon has a Wheel of Fortune spinner!